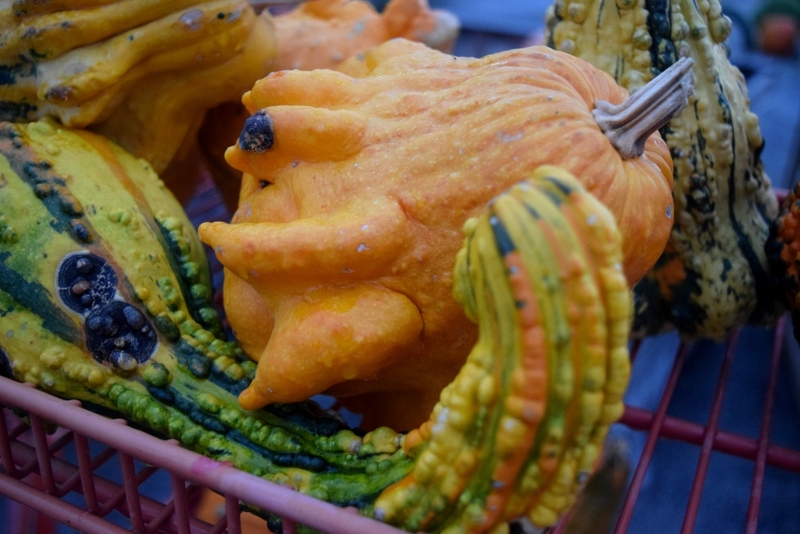 Not too many years do we have the chance this year is giving to shop for pumpkins and Thanksgiving items with a balmy feel in the air. Despite the fact we did receive about 5 inches of snow less than a week ago, little more than a week before that I was wearing a sundress just to stay cool. Not only are we having one weird fall season here, but it is also a wonderful extended summer. I love this because I can wear more of my favorite bare shouldered garments…but I am a warm weather girl at heart, after all! 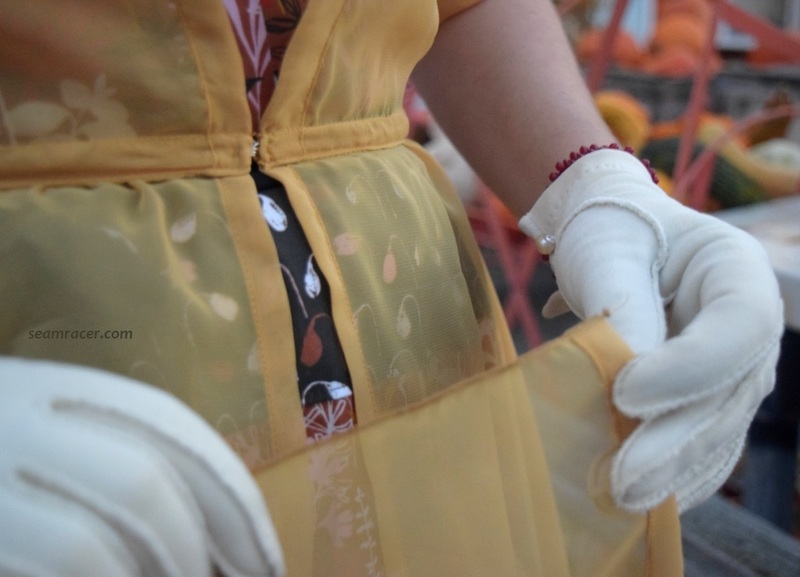 Thus, for this second part to my ongoing blog series called the “Indian Summer of the Sundress”, here is a rich harvest-toned vintage 1950 sundress and sheer redingote set. It has all the colors that the falling leaves and cornucopia fruits of the earth both sport for fall so I can feel ready for Thanksgiving no matter what the weather outside us is saying! Now, just to clarify right off the bat, I only made the sheer redingote (also the hair flower and jewelry) for this ensemble, so this post will mostly be about the portion I crafted. I did not make the sundress. It is handmade by someone else. I know – what an oddity here on my blog! 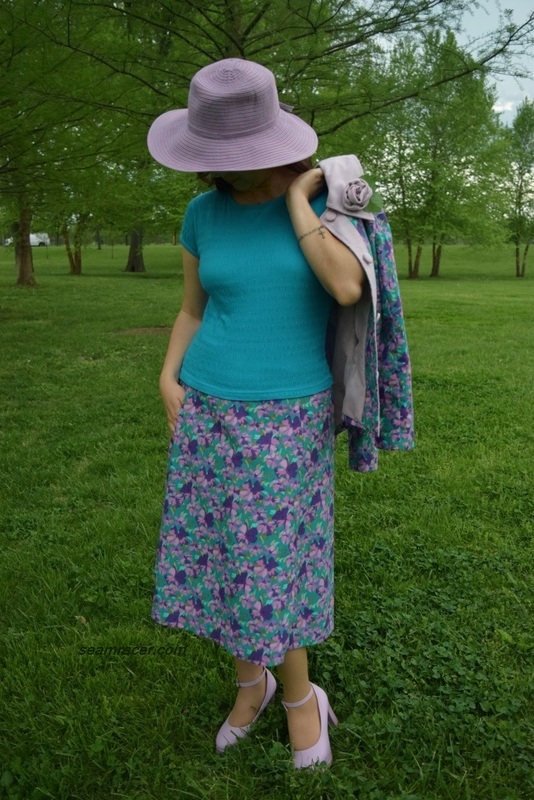 It is a display “inspiration” garment from the “Cloud 9 Fabrics” company, and was made by a certain Catherine Zebrowski using their “Sow & Sew” organic cotton collection from designs of Eloise Renouf. (Follow the link and you can see they made this same dress in a blue, grey, and black colorway, as well!) For this dress, the “Sprouts” print is the contrast along the bodice edge and waistline while the “Herb Garden” is used for the rest of the dress. I love the take they took on this pattern – it’s a complimentary boldness that is cheerful and intriguing, besides being a different, unique take on understanding the pattern. 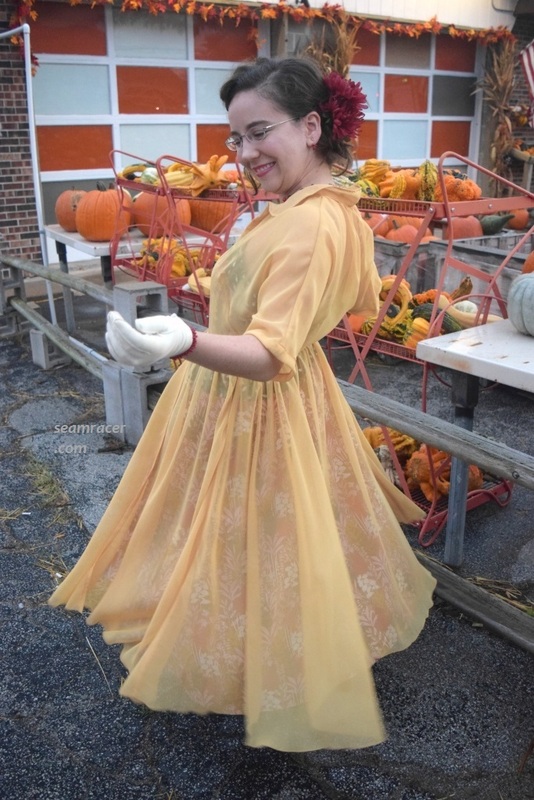 I’m so pleased to have the opportunity to acquire this dress, give it a happy home, and let it shine by completing the vintage pattern set with my redingote! THE FINISHINGS: A sheer dress deserves only the prettiest (and the strongest) seams that you could see on a see-through chiffon! French. The bottom hemline was yards and yards long (being so full skirted) so I used an overlocker (serger) to make tiny rolled hem edges. TOTAL COST: about $25 for the whole set! 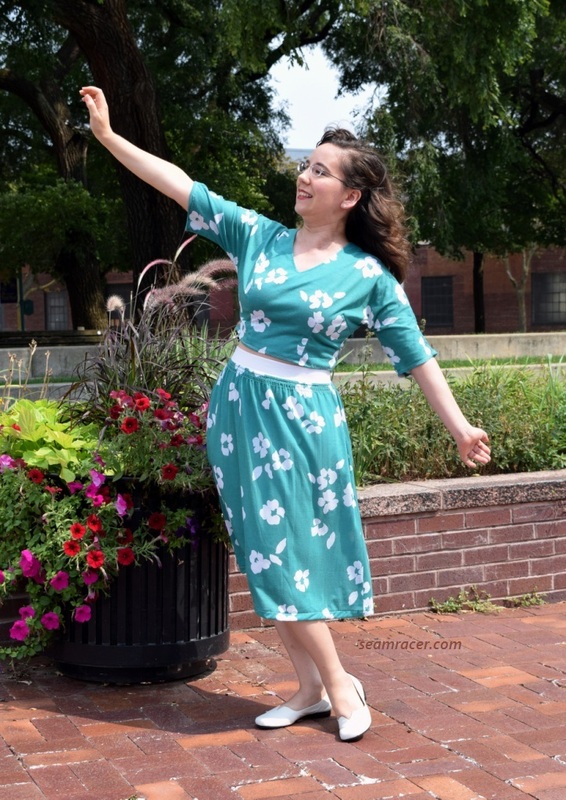 Cloud 9’s vintage dress gave me a much appreciated boost for making this Simplicity re-print. I have been wanting to make it, but my mental caveat was saying “there is a lot of fabric needed (a couple yards) for each piece”, and I knew each one would take a good amount of time to finish. Don’t get me wrong, I am not against spending whatever time is necessary to make the outfit I set my mind to making! 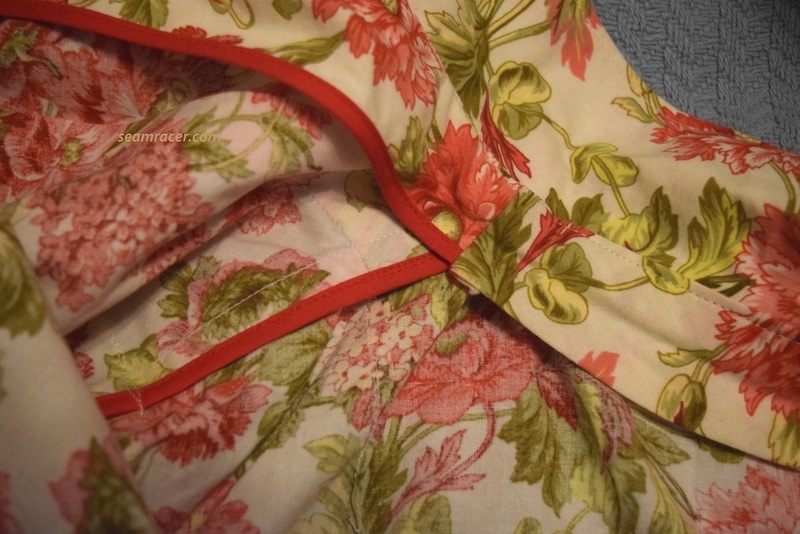 I just didn’t relish the idea of spending the time it would take to sew a completely indulgent and unnecessary item like the sheer redingote after making the sundress, too. 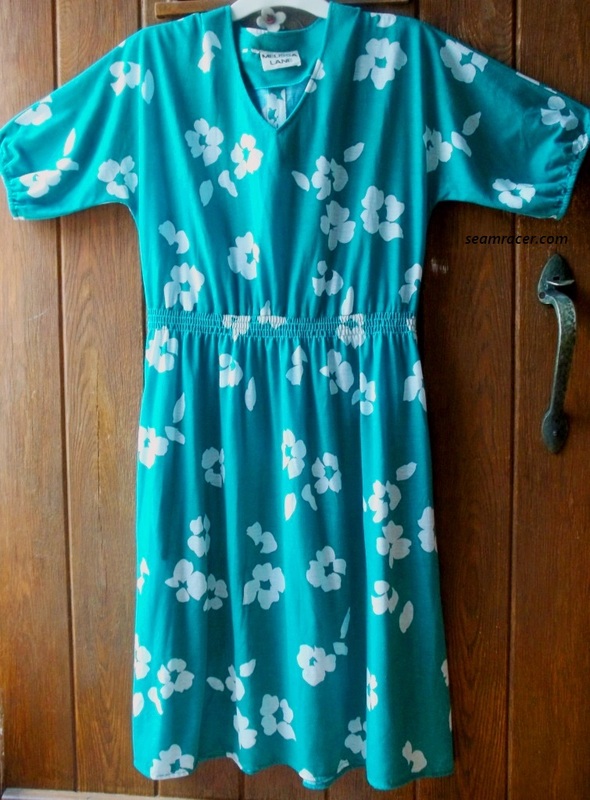 The sundress was what I primarily wanted and will wear the most out of the pattern but knowing it has a matching cover-up that goes with it sort of ‘guilted’ me into feeling like the redingote had to be made as well. I am hoping that I might wear the redingote over something else in my closet so I that it, too, sees more wearings than if it only is paired with its matching sundress. Nevertheless, I thoroughly enjoyed making something based off an idea I love from another creative maker out there! There were some minor changes I made to the pattern. My adaptations only made the redingote easier to make! 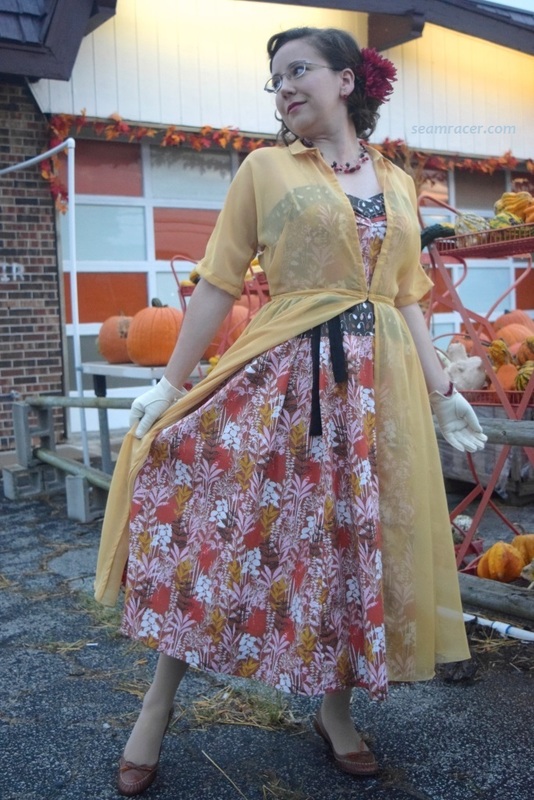 Firstly, the skirt portion is insanely full…a total fabric hog (nice to twirl in though). The tissue pieces are almost out of hand, especially the skirt fronts. They are quarter circles that make the front twice as full as the back. Thinking about the skirt of sundress underneath, I realized that it has all of its gathered fullness in the front while the back is smooth and paneled. This would mean that the redingote for over it would practically be the same way – most all of its fullness in front. I didn’t like the idea of doubling up on poufiness in the front, so the redingote’s skirt was changed to be the opposite of the sundress. I added an extra half-width panel into the skirt back and I folded the patterns skirt fronts in half to cut them out smaller. This way there is partial fullness in front and more in back to even out the poufiness when the set is worn together. My adaptation not only evens out the layers of the skirts but it also makes cutting out the skirt portion a little more manageable. Secondly, I did not cuff the sleeves but chose a wide hem instead. I ended up rather liking the way the longer sleeve ends looked. I felt they widened my shoulders illusionally, thus complementing the waist. Not cuffing the sleeves really made things easier anyway. No really, I did like to look better…I just wasn’t being lazy. Finally, there just a few last cosmetic changes to list! I eliminated the center seam to the bodice back and cut it on the fold instead. In lieu of using interfacing in the sheer collar and taking the risk of either having it be obviously in sight or changing the chiffon color, I used transparent organza to shape and stiffen it. The organza is wonderfully invisible sandwiched in between the golden chiffon and it adds enough body to keep its shape but still be flexible. Lastly, I ditched the fussy front ties shown to close up the front bodice – they’re too distracting if you ask me. I merely put one big hook-and-eye at the waistline, tucking it inside the seams. An open bodice to the redingote shows off the neckline to the sundress underneath. I did make sure that the waistline on this sheer over-dress was nice and strong so that a hook closing wouldn’t rip anything. As I mentioned in “THE FACTS” I did all French seams, even for the waistline. To make the waistline stronger, I turned bodice over the French waistline seam and stitched it down on both sides. It ends up looking rather like a belt, in my opinion, because of the thickness from all the layers of fabric. Besides, anytime there is gathering into a French seam things can feel a bit bulky, so stitching it down made it more comfortable to wear, after all. My accessories add a rust tone to the browns, ochre, and dusty grey and pink flecks by being a deep, burgundy red. 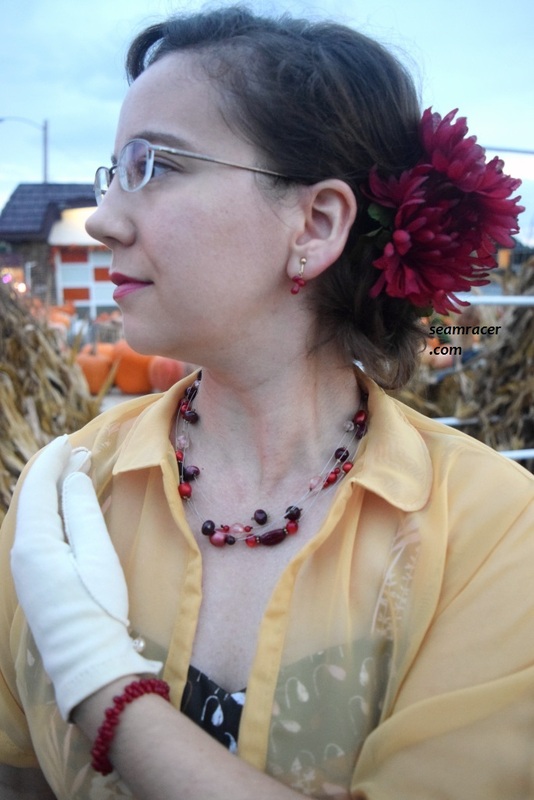 My bracelet matches with my earrings – both I made using Czech glass teardrop beads ordered from Etsy. Since clip-on or screw-back earrings are vintage, I used some old-style blanks that I ordered from a jewelry supply shop in China and tied a handful of the beads so they look like a cluster of berries hanging down. In lieu of a hat, the hair flower is made by me with just two, oversized fake chrysanthemums attached to a hair comb with floral wire and floral tape. Happily, practically the same tone red, described as “sunny terra-cotta”, can be found in my lipstick, “Happy“ from the Besame cosmetics “1937 Anniversary Snow White 7 Dwarfs Collection”. My necklace and gloves are true vintage. 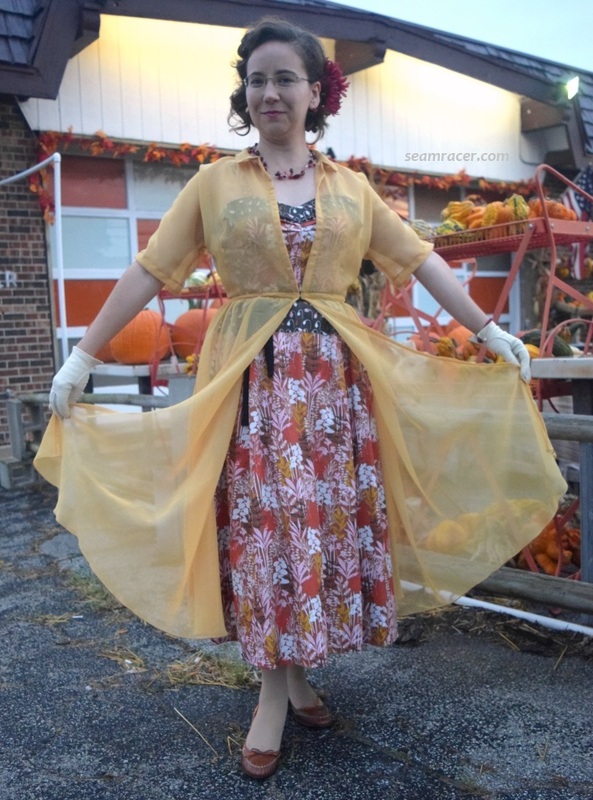 Finding, wearing, and buying someone else’s me-made has helped me appreciate others’ sewing. 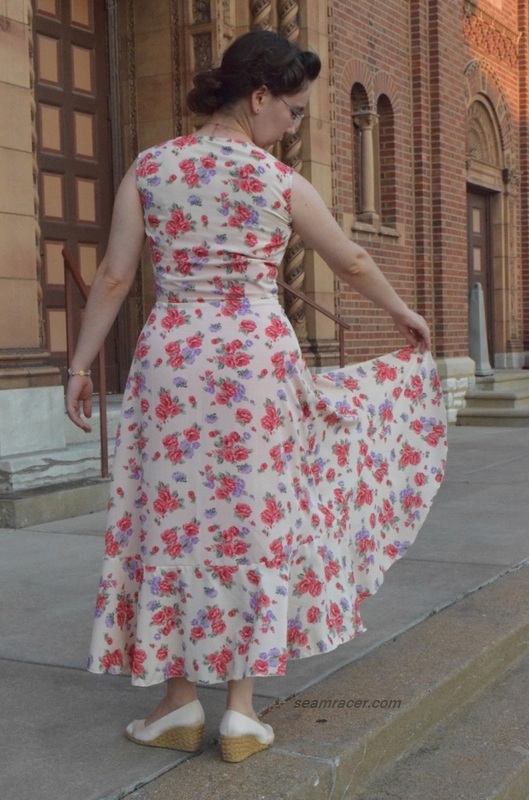 It has also made me realize just how spoiled I am by doing my own sewing…this handmade dress was the only way I felt comfortable and happy buying something new and ready-to-wear! But really – the fact that it was a vintage design fits perfectly into my style. Vintage styles are the best way for me to express my style and feel at ease in what I am wearing. I want to say I don’t think I could have done better, though. It was luckily sewn in my size! I’m impressed by the details and lovely construction to this pattern – they even sewed in an invisible zipper up the side! Besides, I haven’t yet splurged on organic cotton for myself. So – on top of all the other benefits I’ve already listed, this dress is a real treat. People don’t know what they are missing. If you can’t make it yourself, the feeling of having something made for you can’t be beat. Make what you wear, handmade or store bought, “yours” in some way, even if that something is as little as a family jewelry piece or a full out sewing project like I did. After my last post, I still had the bug in my system of wanting more knock-off “copies” of the costumes from the 2008 movie “Australia”. I remembered suddenly I did have the fabric in my stash, just waiting to be sewn, to have one of Nicole Kidman’s very practical shirt and skirt outfits she wore out on her northern open land of Faraway Downs. The combo of stash busting and making a movie inspired outfit is both useful and feels great! 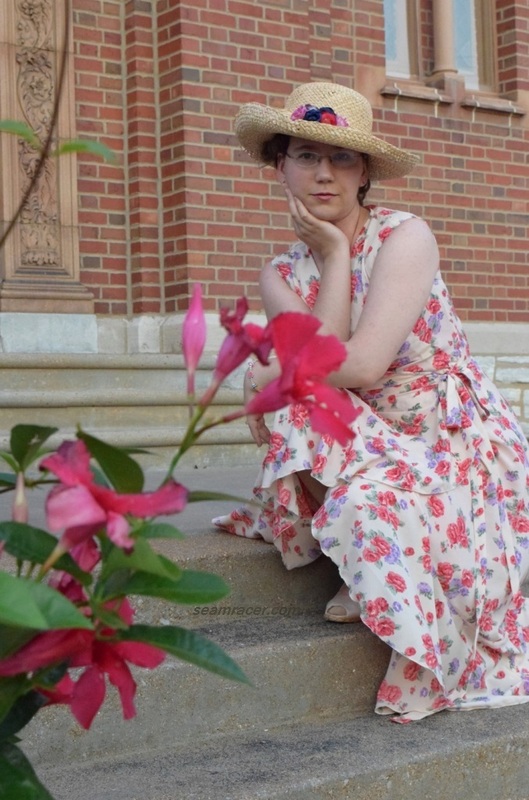 In my mind, I’m not in my mid-western American town wearing this…I’m “down under” during the lush wet season. The blouse was the only thing I made from scratch for this outfit, as I did do a fair amount of work recently to make the skirt something I like to wear today. You see, the skirt was bought ready-to-wear quite a while back now as I have had this since my early teen years. At this point, it’s probably almost vintage. I ought to just be happy I still actually fit in something I’ve had for two decades, I suppose! Anyway, since about 2005 I have had the skirt stashed away as something I was no longer interested in and saw it as a possible source for a refashion. 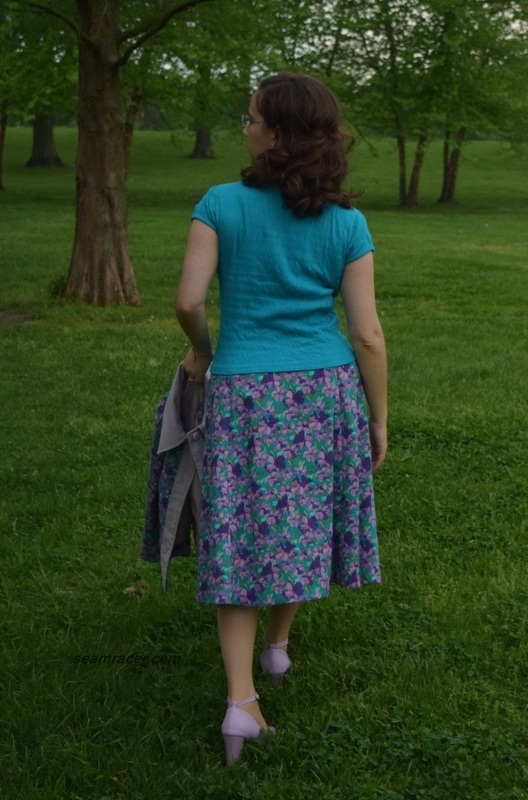 When I realized it was almost line for line a copy of Nicole Kidman’s skirt in “Australia” (gosh, it’s even the exact same plaid with the slight lavender striping!) I picked this back out of storage to give it TLC it needed. 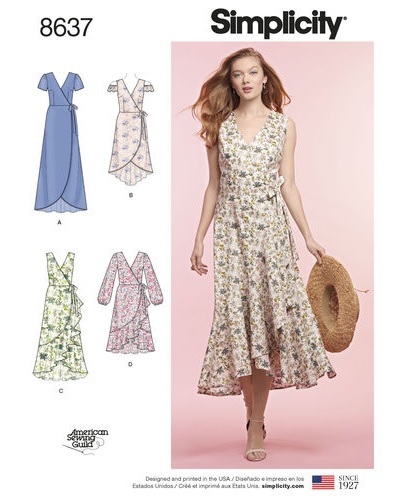 The updates primarily included shortening its former long length with a wide hem and using some of that excess fabric from inside the hem to make four belt loops to stitch on the waistband. Many accessories are true vintage and they are all some of my nicest items. The belt is all leather and a very dramatic and awesome 1940s style from the 1970s. My neck scarf is all-silk with a hand-rolled hem, found at a vintage shop, Anne Klein brand. 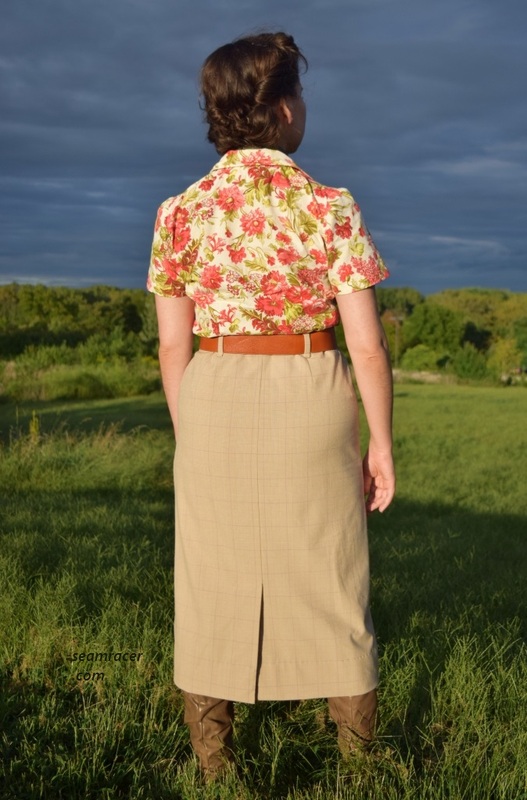 My ‘almost vintage’ dated skirt is “Norton McNaughton” brand, and I love the quality finishing inside…the plaid matching is impeccable and there is bias binding over the edges inside (worth saving). My boots are one of my favorite brands – White Mountain. Trekking through the tall grass needs tall boots! Finally, my perfectly matching coral red lipstick is “Happy” from the Besame “Snow White 1937 Anniversary Collection: Seven Dwarfs” set. NOTIONS: I had everything I needed on hand – thread, interfacing, bias tape, and true vintage, real carved shell buttons out of the inherited stash of Hubby’s Grandmother. TIME TO COMPLETE: one evening’s worth of about 5 hours – it was finished on September 7, 2018. THE INSIDES: all bias covered in a fun and cheerful bright red tape! Now, the best part about this blouse was the assurance that it would be my size directly out of the envelope and that it would turn out great. I have made the trousers twice before now using this same pattern (see here and here), and they needed not an ounce of alterations to fit like they were designed with my body in mind. I took it for granted that the blouse would be the same perfect fit and I was correct here. I do need to make another copy of this so I can have a permanent copy for myself because this pattern is worth its weight in gold to me! 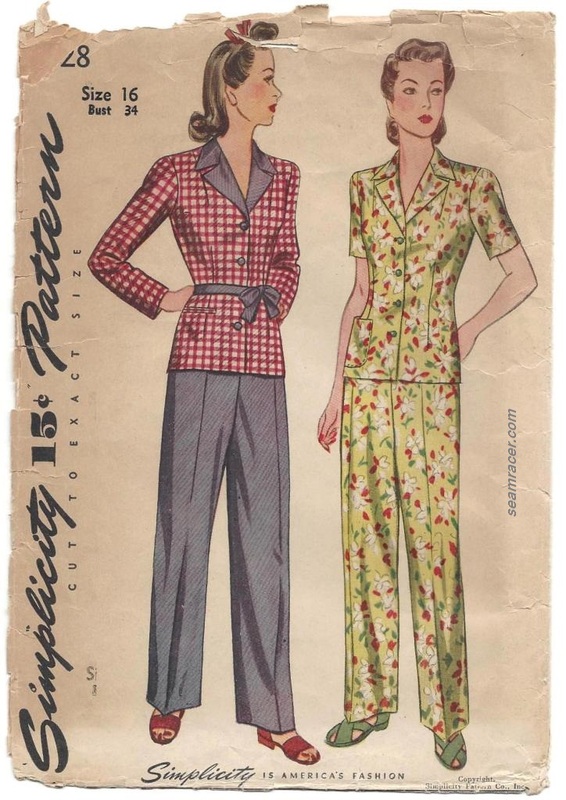 This pattern is technically listed on the envelope back as a “pajama set”. This to me is more like a home lounging set which looks so close to regular clothes that if the pattern is made out of apparel fabrics (cotton, rayon, shirtings, or twill) both pieces can pass as street wear, I believe. Made of flannel, knit, or a quilted fabric would no doubt bring it closer to pajamas. Either way, this is a practical and cute set with just the right amount of details. Nighttime and at home clothes were much more publically presentable in the 1940s the more I look at that era’s patterns. I LOVE the lapels to this blouse! They’re so defined and equally pointed for both lapels with just the right amount of 40’s obnoxiousness that most collars from that era have. What I found strikingly unusual about this is that the buttons only end mid-chest. 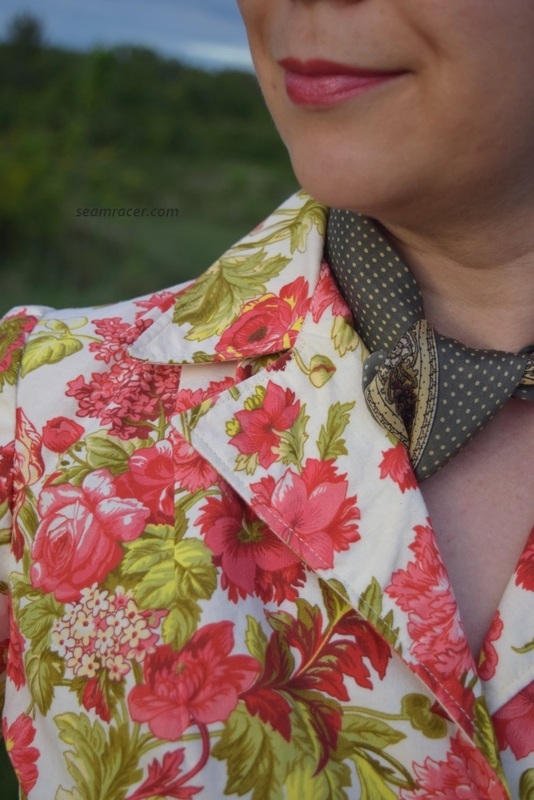 Most other vintage convertible collar blouses still direct you to make buttonholes and sew buttons down all the way up to the top (multi-use) even if you don’t really plan on closing it that high (I don’t always listen that well to such directions). The lapels are tailored well apparently because they are meant for showing off! It is hard to find a 1940s blouse that is lacking the shoulder gathers and bodice gathers, so this one is a real gem. As much as I like blouse details, a smooth vintage blouse, or at least one with only darts to shape it, is harder to spot which original era it comes from and is best for thicker fabrics. 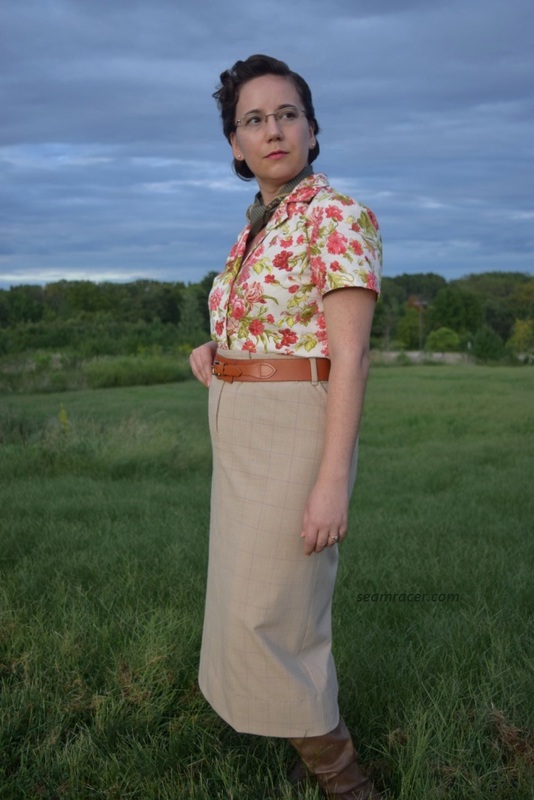 I have only one other true vintage 40’s era blouse design like this on hand – a year 1941 Simplicity jumper outfit pattern that I have used 3 times now (see the first version here and the second here). 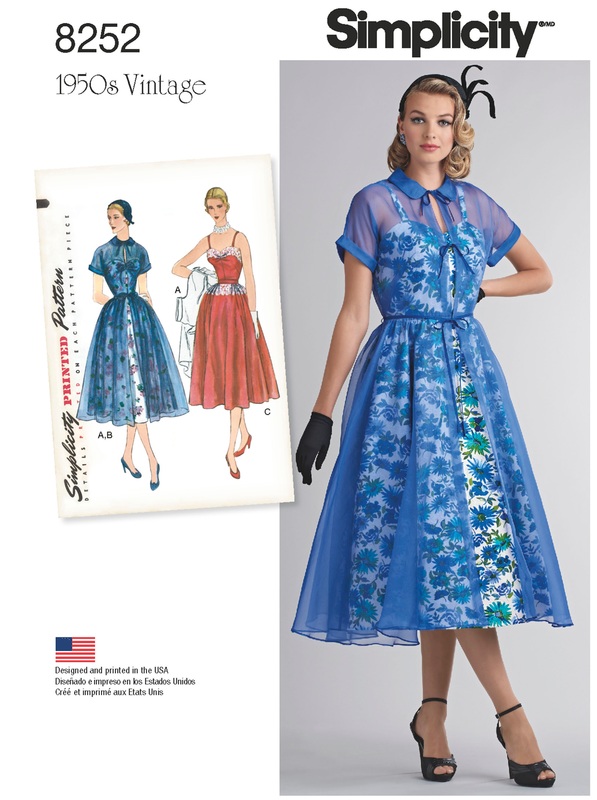 The date of this pattern – 1943 – is great for matching up with the supposed year of the movie scene my sewing was inspired by. 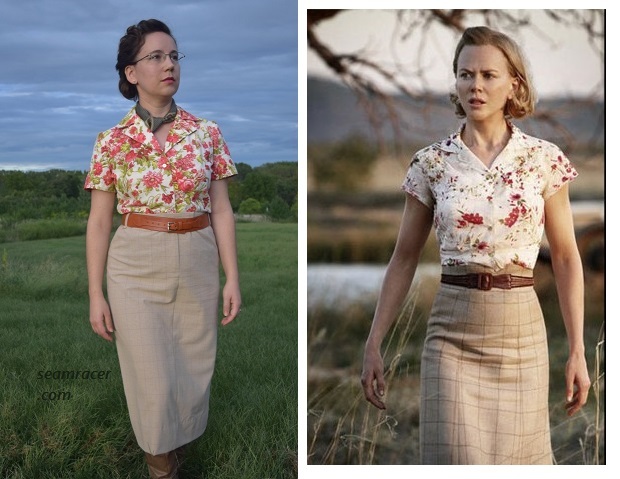 This outfit comes from the last few minutes of the movie before the credits roll, and it was supposed to be about a year after the bombing of Darwin, which happened on February 19, 1942. It was the first time that country had been attacked on their own land by a foreign power, and some reports say that 90% of the buildings were destroyed. As Japanese Aid Raids continued on the country until the end of 1943 and she was staying back and not returning to Britain, so the safest place to go was into the wild country, the Faraway Downs. But her ideal of a peaceful family life was not meant to stay forever as is seen in the ending scene. Since all of Kidman’s outfits in “Australia” are so awesome, I do hope to make my own versions of more, but this will be all for now. There are so many other projects in my queue, and with the season of Fall fast approaching, I know when to stop and be practical, but this outfit was too easy to whip up, and is too comfy to wear to have passed up for another time. I hope to be prepared ahead of season with some transitional grey, black, and deep wine colored dresses and squeeze in the last of the warm weather garments while the sun is balmy with what projects I am sewing (and posting) this month and the next. 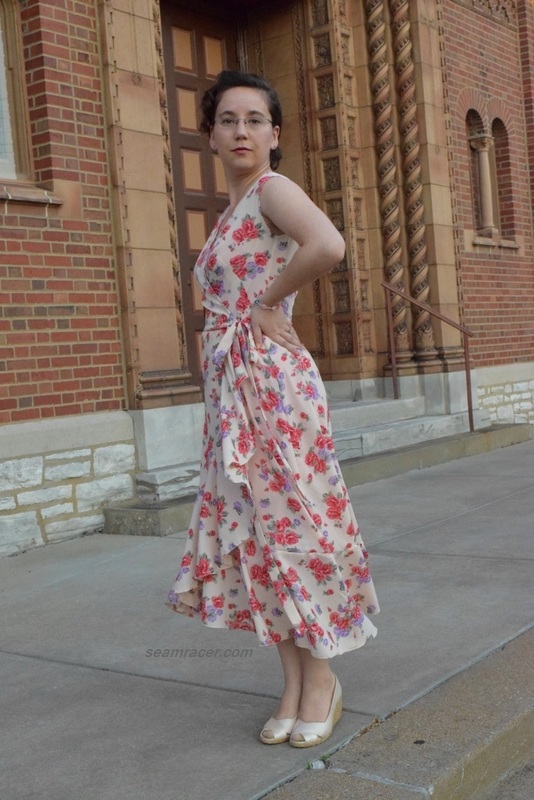 After my most recent 1920s style wrap dress, I couldn’t help but whip up another, this time modern one, for the “Sew Together for the Summer of the Wrap Dress”! This will not be a history based, or even a lengthy post, but this is a pattern which is only about a month old now so my dress is “hot off the presses” so to say! Here’s just a quick post here to show off my newest make. NOTIONS: I just used what I had on hand to finish this dress – thread, leftover bias tape, a spare button and elastic. TOTAL COST: This fabric was bought from Wal-Mart back in March 2013 at $28 for 5 yards (only know this because I still had the receipt with it). But when it is something languishing in my stash, I’m not really counting cost now, anyway. This dreamy baby of a dress just floats as I move and is a weightless romantic thing to wear for summer! Plus it is totally a throw on, or should I say ‘wrap on’, and go dress. It was quite easy to sew overall, the biggest challenge was dealing with sooo much fabric…5 freaking yards! This was an opportunity to use up a quaint floral polyester just sitting in my stash for many years with no previous idea of what to make of it. Not too often (but every once in a while) a fabric makes its way home with me for no other reason than it was pretty and made me feel good. I love when those purchases get justified when they become a garment I enjoy. 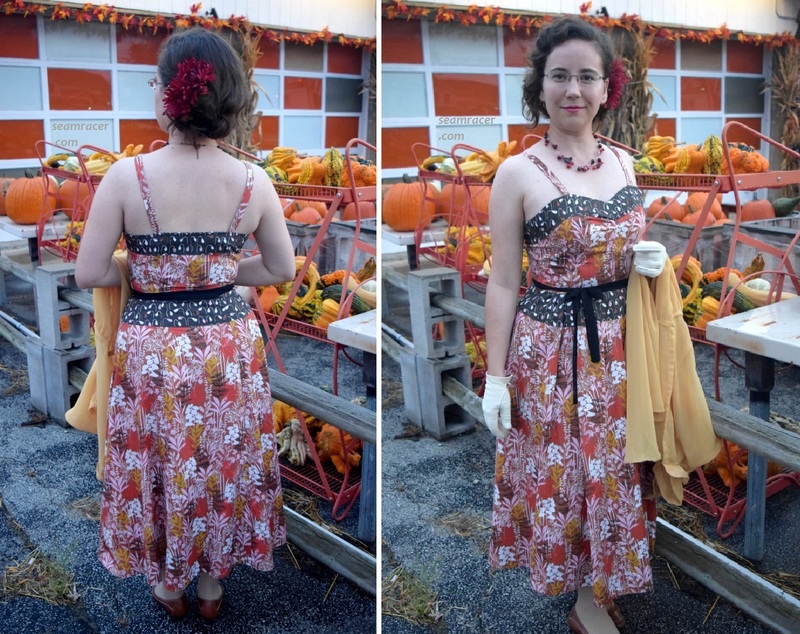 Funny, I recently saw a vintage Instagrammer make a 50’s dress from this exact same fabric (see it here)! I did make a few changes to this pattern. Firstly, shortened the length by 3 inches, taking it off of the hem. This way I avoided having to adjust the entire flounce, and kept the seam where the flounce attaches to the skirt horizontal to the back of my knee (from the back of the dress). I wanted a long dress, but not so long it hides my shoes or gets in the way of my ankles. Secondly, I changed the front darts of the bodice. I disliked the very basic darting as it was designed. I find it very jarring to the elegant and flowing feel of the rest of the dress. However, I feel that a basic bodice is needed with so much going on from the waist down. So I merely closed up the existing darts and changed them into single French darts with go across the bias and come out of the side seam. Thirdly, I stripped the pattern down to bare bones. It called for a fully lined bodice with facings to finish the neckline. As my fabric is semi-sheer, I wanted the whole dress to be the same, so I could wear different opaque slips underneath. Thus I left my dress unlined, and did a bias bound edge along the neckline and armholes, in lilac too, to match with the flowers on the fabric! Otherwise, all the seams are French for a clean, strong, and professional touch. Finishing the flounce edges was a real challenge. I knew a skinny hem was absolutely needed. How to do that was the problem. Sure I could do a skinny rolled hem or at least a ¼ inch (or smaller) hem by hand or with my machine but the thought of spending that much effort and time on a dress that took me only a handful of hours to make was not appealing. Not that it wasn’t worth it, but my time is valuable too. 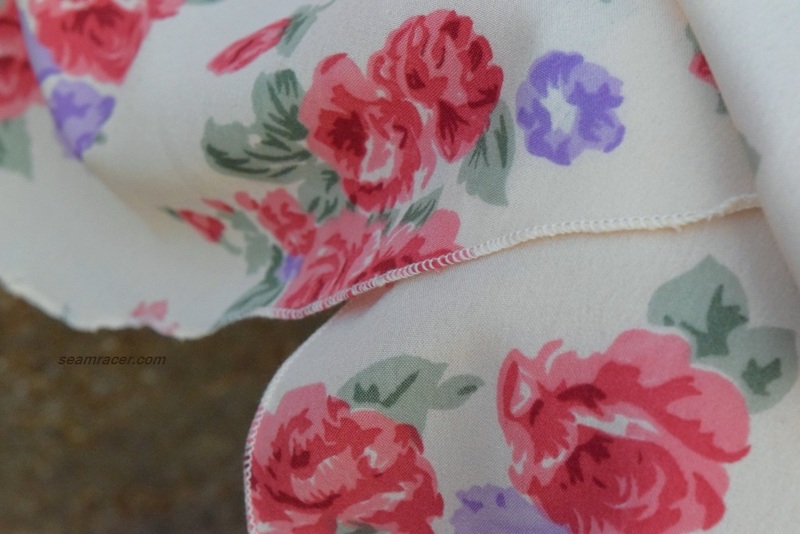 So, off I went to my town’s local community sewing room to use their serger (overlocker) machines to quickly and beautifully finish off the flounce’s hem edges. I made a lovely, incredibly tiny, and very clean hem that is just as pliable as a raw edge by doing a rolled hem on the serger (overlocker), the same finish that many table linens such as napkins receive. This finishing for the hem is something I want to venture and say is a must for this dress…this is how pleased I am. Bribe a friend, find a sewing room, do whatever it takes to use a serger if you don’t have one just to finish an edge as if nothing is there with an overlocked rolled hem. This is my first time doing such a stitched finish, and will not be my last! I did go up a size for this dress and it’s a good thing I did too, because this seems to run small. I also think the bodice runs long, as well. It is not bad enough for me to warrant taking the time to fix it. Nevertheless, it is something to watch out for with this pattern and I will be adjusting that if there is a next time for me to make this. Honestly, I did not even use the instructions. I did a preliminary once over before I did any stitching just to comprehend if there was anything unexpected to do. After that, though, I wizzed through the dress on my own, which was easy to do as I made the pattern less complex leaving out the lining. I made the wrap dress’ closures completely a matter of my own taste. I drafted my own ties because I wanted them super long to be flowing with the flounces. For the inside closure, I didn’t want another set of ties…I’m used to that being for house coats. 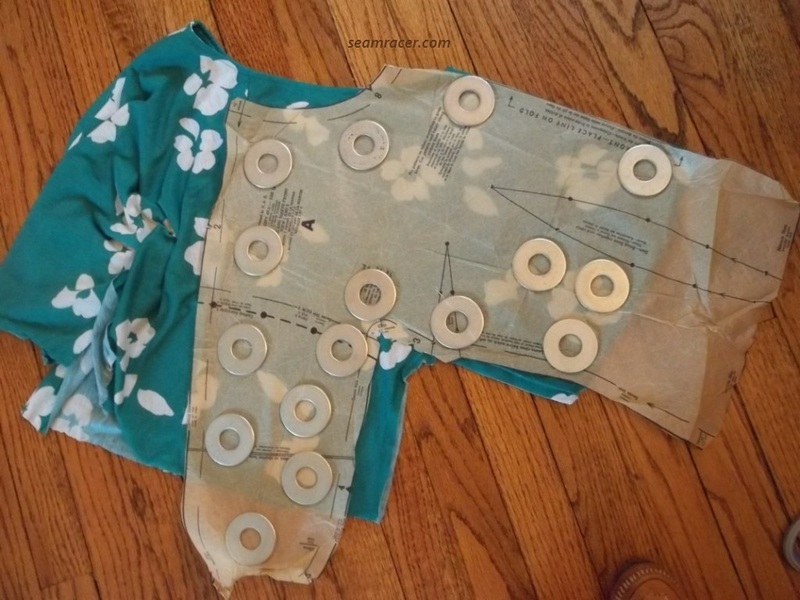 Thus, I sewed a button to the side seam point where the bodice and the skirt join with a short length of buttonhole elastic coming from the other end for a comfy, stretchy, easy, and secure way to keep the inner wrap closed. I love this elastic with its pre-made holes. It’s so handy for so many things. As much as I do like this dress, I mentally suspect that this is a sort of style reversal for me. It reminds me of what I was buying and making for myself to wear in the late 90’s and early 2000s. The skirts and dresses I picked out and sewed then mostly had bias flounces, bias panels around the legs, and romantic florals. I really don’t think it was just because I could sew for myself either. This was what was also in the stores, as clothes to buy and as fabric offered. It’s not that I didn’t like the style…I did very much and still do! However, my style as an adult has changed a bit and I feel sort of weirdly full circle to come back to my past through sewing my own fashion today. The 90’s has been popping up again in recent fashion – just 6 months ago, for winter, I was seeing velour tank dresses worn with chocker necklaces displayed in some of our stores! Life is weird sometimes…either I’m getting old or fashion is lost and desperate as to what to do for me to see styles from my younger lifetime popping up again. I really think it is the latter reason! Of all the items I have made in my life, it is hard to believe that only now is my very first sewing using a designer Vogue pattern! Even though this might not be the most spectacular or glamorous project to start with, the beauty is in the details and the rich, significant background of the designer. This is also a very comfortable and useful dressy set, to boot! 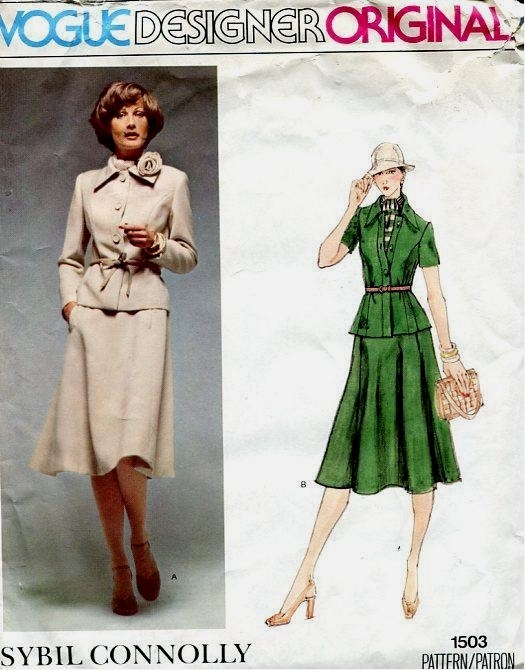 I present my year 1976 suit set of Sybil Connolly, the leader and founder of Irish Couture. 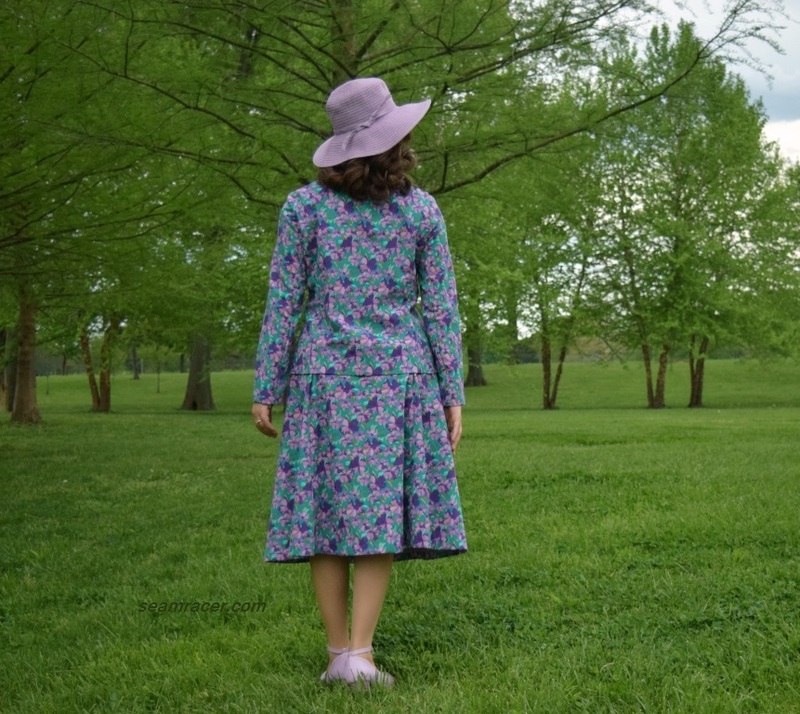 First of all, I want to say that I am counting this as part of my 21st century progressive Easter day creations I have been making since 2013, starting with a dress in the year 1929 style. Since that Easter day outfit, I make something from the following decade for the next year’s holiday. 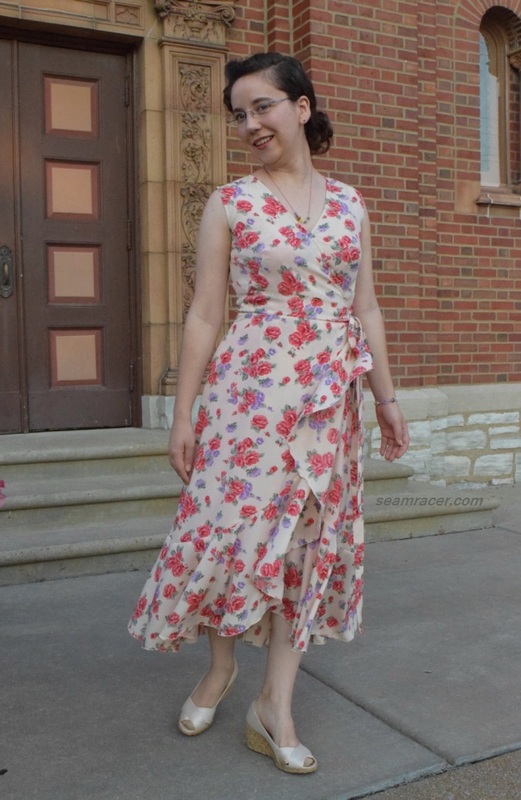 (See my 1930s Easter dress here, and my 1940s one here.) Only since I made this set from the year 1954 did I begin keeping with suiting. This year 2018 was naturally supposed to be something from the 1970’s (after this one last year from 1960), but as our Easter day turned out to be incredibly cold and snowy, this suit set had to be put off being showcased until the next spring holiday – Mother’s day! Happily, the grass and trees were overly lush and green by the time I wore my new vintage suit set! FABRIC: a cotton-rayon blend “linen-look” material, in a solid orchid color for the contrast and a floral for the rest of the set. 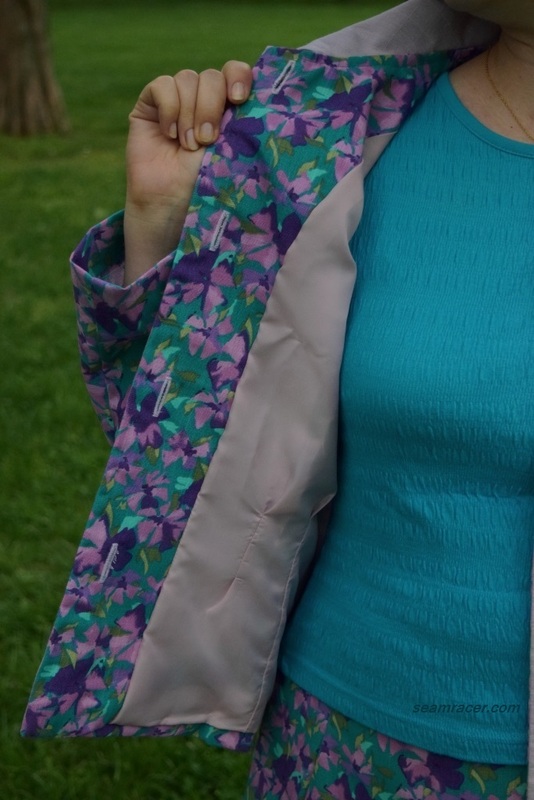 Leftover polyester lining (in a matching orchid pinkish purple) from my stash was used to line the jacket inside. 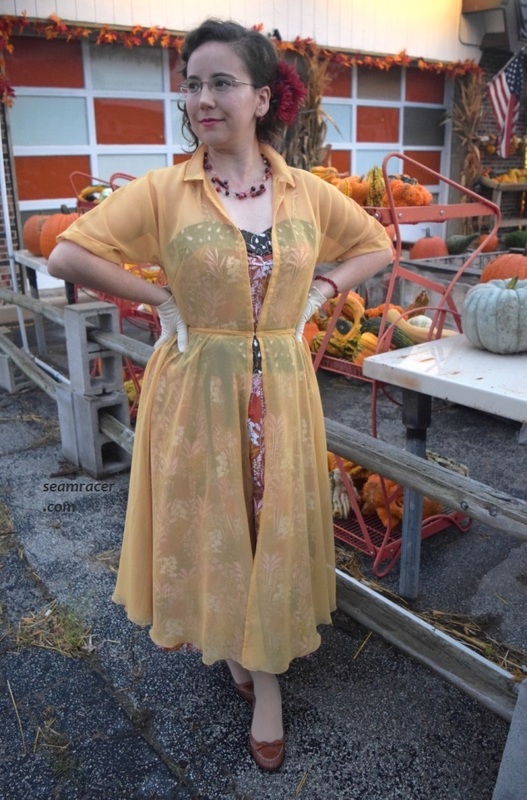 NOTIONS: I pretty much had everything I needed – thread, zipper, interfacing, and bias tape. The only thing I needed to buy for this specifically was a button making kit for matching fabric buttons! TIME TO COMPLETE: This was a relatively easy pattern for being a detailed designer project – but of course leaving out the skirt lining step helped, too. I made my suit set in about 25 hours’ worth of time and it was finished on April 8, 2018. THE INSIDES: I’ll admit I took the easy road here for the internal finishing. My seams are covered by the lining for the jacket body, left raw for the sleeve seams inside the arm, and bias bound for the skirt. Bias seams are not my preference for making my own copy of a designer garment, neither are raw edges, but this fabric doesn’t really fray and I wanted my set done for Easter-time…only I didn’t wear it for Easter anyway! Oh well. TOTAL COST: This fabric was bought on deep discount when the now defunct Hancock Fabrics had been closing several years back. I believe I bought the fabric for about $2 a yard. With about 3 yards used, and the notions I bought, this suit set cost me just over $10…how awesome is that?! For some reason, I found it incredibly difficult to find a dressy suit set from the decade of the 1970s. I have a sneaky suspicion that this is due to the casualness that the youthful-oriented and stretchy knit fashions introduced, as well as the greater political and social liberties of women. Enough said. Whatever the reason, suits of the 1970’s seem to be quite relaxed, mostly with pants for the bottom half, and frequently with a tunic-style jacket or a safari-style over shirt. Leave it to a designer to offer my taste just what I was hoping for but having trouble finding! This suit feels unpretentious, but still polished, as well as being timeless with a 70’s flair. It was just enough of a challenge to make, yet still easy enough to enjoy the sewing. It has unexpected details to make my creative heart flutter yet these are subtle enough to go unnoticed to the casual observation. Besides, now I have the opportunity to both appreciate and share the story of a designer that deserves to be better known. Ireland had long been considered a country without its own fashion. Sybil Connolly changed that. She had been brought up in Waterford County, and trained as an apprentice dressmaker in London starting in the late 1930’s at seventeen and by the time she was twenty-two (WWII times) she was a workroom manager and company director for Jack Clarke, a fashion retailer in Dublin. In 1954, Carmel Snow, then the editor of Harper’s Bazaar, discovered Sybil Connolly who had just come out with her first collection, featuring the use of her native Irish fabrics and embellishments, most notably Irish linen, only the year before. With the combined help of the Irish exports board, Connolly launched Irish Couture into an international spotlight with her introduction to New York’s fashion scene. What she made often showed a woman’s natural body form (in contrast to the likes of Balenciaga) with such dresses as her white crocheted evening dress that was featured on the cover of LIFE magazine in August 1953. Her inspiration the sentiment “A woman’s body is inside. It breathes. It moves. So I must see movement in a dress.” By being true to herself, her tastes, her roots, and her determination, she stood out in the fashion world, gave women attractive options to wear, and gained a new respect from the world for her culture. By March of 1955, Vogue magazine was mentioning Dublin in the same sentence as Paris, London, and Milan! Connolly was adamant about using her fashion line to support business and export trade in Ireland, by not only using Irish textile manufacturers, but even employing over 50 local women to hand make some of her laces. At the Glencolumbkill Agricultural show in 1956, she had said, “I feel that as long as we can show such beauty in design and texture as we do in our Irish cottage industries, we cannot ever be called a vanishing race.” Click here for a “Glamourdaze” article to watch (in color!) Sybil Connolly’s 1957 fashion show at a lovely Irish castle. Most of her designs at this time were inspired by rural, traditional garments and materials. This is cultural approbation at its finest. For me, I have strong Irish roots on both sides of my family, Sybil Connolly’s work is a personal thing that touches a tender spot. I too love and appreciate the fine laces that my Irish (paternal) Grandmother hoarded (which I now have) as well as the Irish simple beauty of life that my Irish (maternal) Grandfather enjoyed. If you follow my blog you have already seen and read my great appreciation for linen, in all its forms. Now, I know – my suit is not real linen. It’s made from modern linen-look fabric. It’s also not in a solid color, as was her wont in her creations. However, I feel that this is me personalizing my own Sybil Connolly fashion, and I can see this step as something she would approve. I love a linen-look fabric, and I LOVE a purple print…so, this is a set that is all me, for me, designed by a woman that I respect who has my same cultural ties. This pattern is from 1976, though, decades after the height of her career (the 1950s). She had dressed all the most well-known social and political names such as Jackie Kennedy, the Rockefellers, and Liz Taylor through the 60’s and began designing for Tiffany & Co. (glassware) as well as releasing luxury home goods (such as fine table linens) by the 1980s. So this, pattern was at the far end of her fashion career, when she was trading talents. I have seen that her mid-to late 1970s patterns have very similar, repetitive qualities to my own pattern’s set. Many of her skirts (excepting her trademark hand-pleated, taffeta-backed linen skirts) have the same paneling with pockets (see Vogue #2998). Many of her garments had a recognizable continuity even in 1992 as they did 40 years earlier. Often, designers who began in the pre-WWII times (such as Mainbocher) had difficulty dealing with the harshly contrasting ‘hip’ and youthful trends of the 60’s-70’s-80’s. However, she was a multi-faceted woman (she even wrote books!) and found a way to keep her head up apparently to still have wonderful, lovely designs like this pattern for many decades. That is pure ingenuity and a stamp of a classic style. Connolly maintained that she knew, as all women designers should, that “good fashion does not need to change”. One of the major details which slightly dates this suit is the enormous collar. This is so 1970s and a natural style for Connolly to adopt here to be on point for 1976. An oversized collar is the most common, recognizable feature to shirts and jacket necklines that I see and make from the 1970s. Other than that, the rest of the details are pretty timeless, and finely crafted. The sleeves are the classic two panel style seen on most suits. 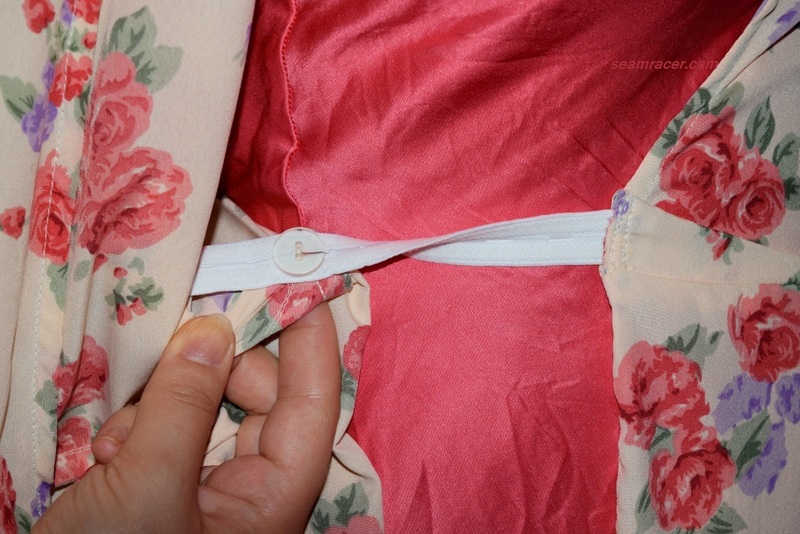 The body of the jacket has a princess seam running vertical down through the bust, starting from sleeve and running to the hem, separating the front from the side panel. The side bodice panel has a sneaky extra shaping dart close to where the side seam is while the back is pretty bare bones, yet still shaped nicely. As this is supposed to be a warm weather jacket, I didn’t line the sleeves and I left out the shoulder pads to keep this lightweight. As I left off the bias tube belt the pattern called for to wear over the jacket, I instead made sure to keep another accessory detail that can be spotted on the example garment shown on the pattern envelope cover. Can you find it? 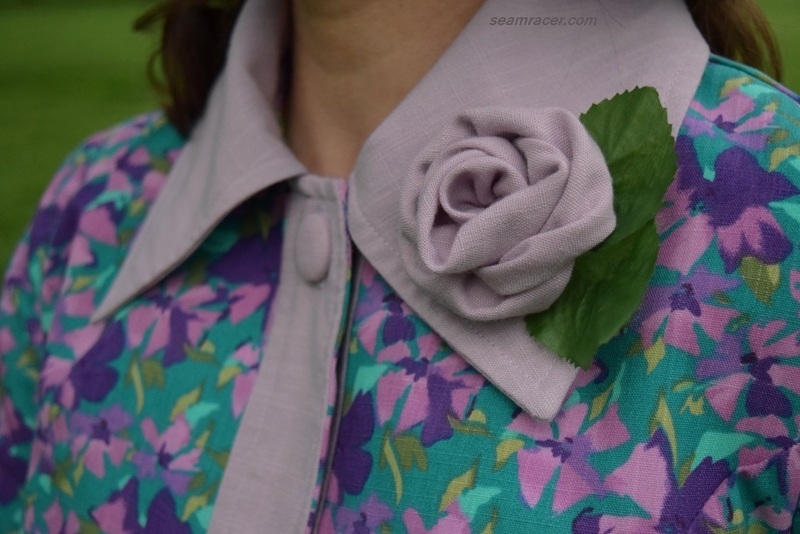 I made my own clip on fabric flower to match for the collar! I used the 1950’s Dior-style bias method (which you can see here or here) to start with and slightly adapted it so the flower is more compact like a double rose. Making fabric flowers is my new favorite thing to do with my scraps. Not only does it use leftover fabric, but I end up with a wonderful matching accessory. Plus it’s fun (very important) and is an excellent way to practice precise hand sewing. Small-scale, often time-consuming details like this fabric rose remind me of the labor of love which went into Connolly’s creations. My favorite feature to this set is possibly the smart button placket to the jacket. It is only on the exterior front, made a bit more obvious by my solid contrast color. There is only a wide facing on the inside. This is unusual but lovely. I couldn’t find it in my heart to break up the color and texture of the front placket by using anything other than matching fabric buttons, so I bought a kit to make them myself. I feel like this brings the jacket’s detailing to a whole new level equal to a designer pattern. My next favorite feature is the smart pockets in the unexpected gore design of the skirt. 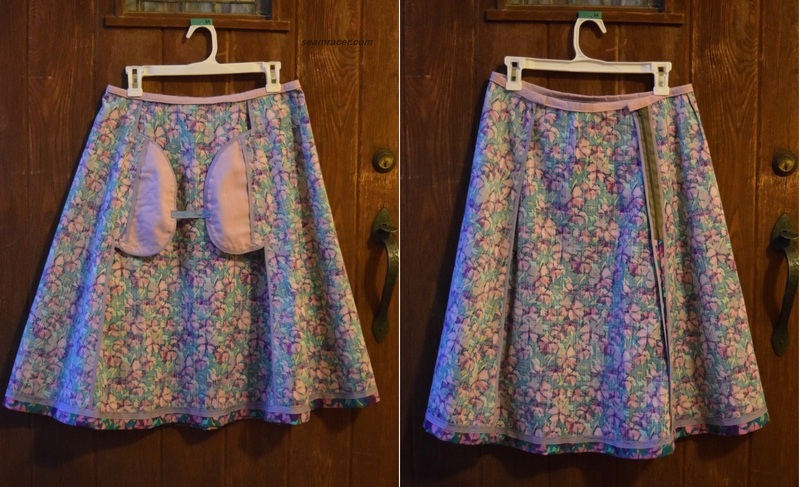 It is a four panel (or gore) skirt with no side seams. There are center panels in the front and the back, with one wrap-around panel to either side. The waistline has small darts coming out of it, ending at the high hip, adding shaping there in the absence of a side seam. 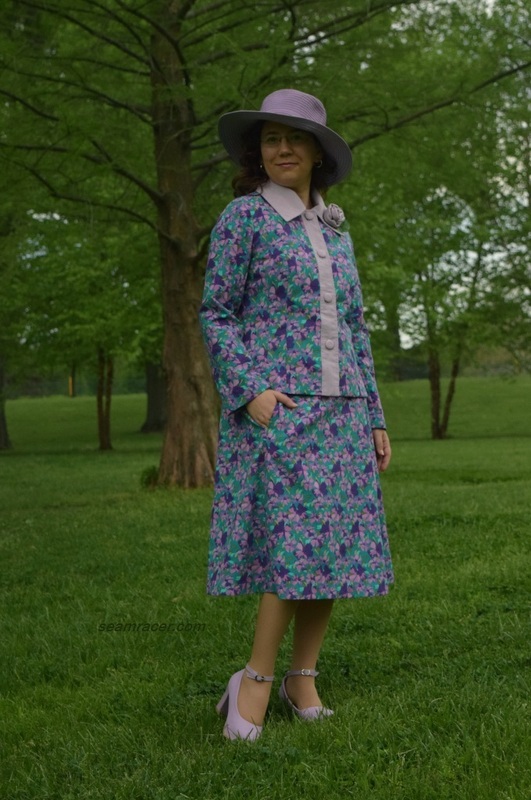 I think I have only seen no side seams with a side seam darts with my 50’s pencil skirts (here and here), so it is another uncommon feature for the 70’s. With such seaming, do you know where the zipper closing went? In the left back side seam. This makes it kind of tricky to close unless I twist it around to the front of me while dressing. The pattern called for a flap closing back much like the front buttoning fly to men’s trousers and historical breeches. I simplified that by sewing one side closed then adding a zip in the other. 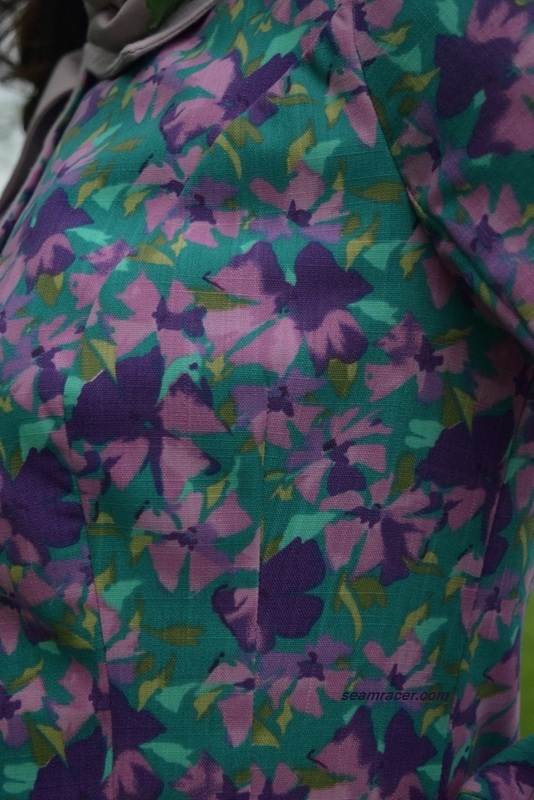 Then I continued with the contrasting color I had been using on the jacket to make the skirt waistband out of the solid orchid color linen-look, as well. I suppose you have noticed my hands slipped into some well hidden front skirt pockets. What you may not have detected was how the skirt is a straight A-line shape from the front, while the back is gently fuller. Anyway – back to the pockets! They are so handy in the way that they are deep and generous to hold many things, and they are at the perfect height for my arm length. The pockets inside swoop in towards one another, and to keep them that way there is a small length of bias tape to connect the two. 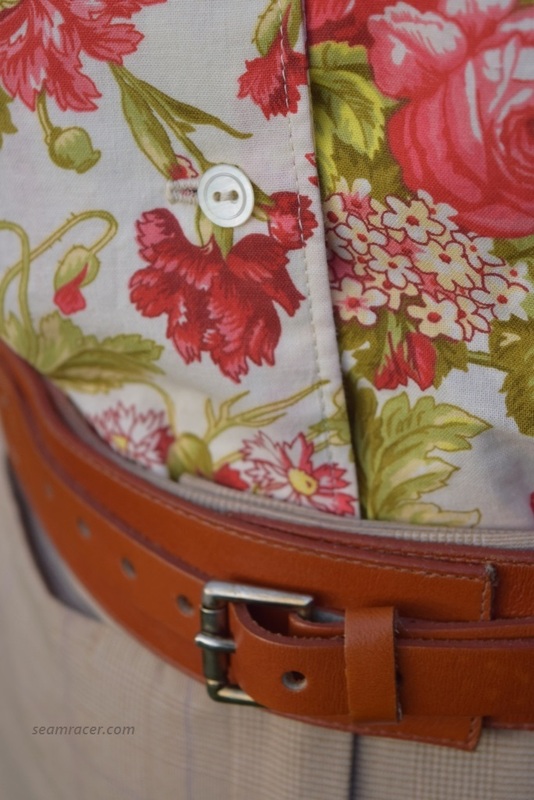 Whenever there are pockets like this I always think of them in connection to a kangaroo, because they give me room to hold things over my tummy! 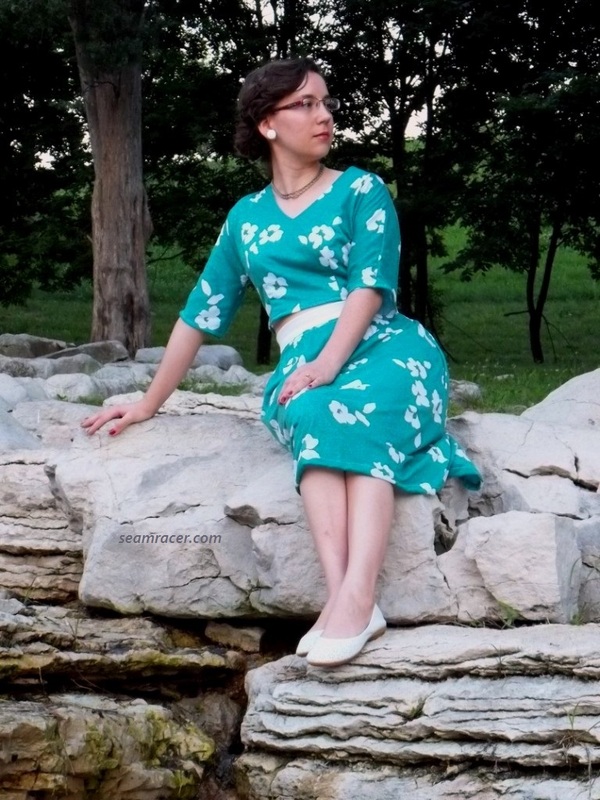 The pattern I had was a slightly bigger size than what I needed, so I used the same method I used for this 60’s dress. I cut off the seam allowance on the side and shoulder seams, and made slightly wider seam allowances. Read more about it in this post. I’m really liking the perfect fit I end up with this method. 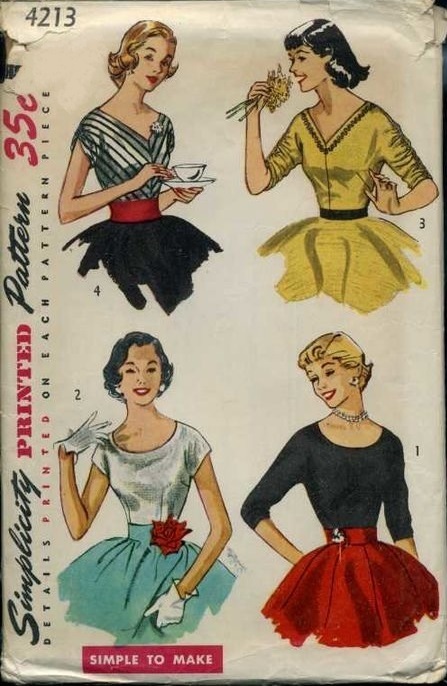 I am now quite eager to dive into my next vintage Vogue designer pattern. I have already bought a few more while I was in the post-project happiness – among them ones from the 80’s and 90’s for my Easter suits of the next two years! I love how designer patterns give me a reason and opportunity to learn more about the talents, individuality, and biography of garment creators that made it big. Unfortunately some of them have been better remembered in history than others! In fact I prefer the forgotten or little known designers because it helps me associate myself better with them. I might be sewing using a designer pattern, but most importantly anything I make means I become my own designer. Home sewing is so underestimated. One person does all the jobs of a whole fashion house. Sybil Connolly had bystanders remark of her (at a party she attended in 1946, before she had her own line of clothing) that “Wearing her own designed dress, she was her own best model.” That is my ideal, to have me – the creator of what I make – be the foremost representation for what can be accomplished at the hands of a dedicated seamstress. It’s like wearing your art on your back and being your own silent spokesperson for what you do. Whether it gets seen or appreciated, that fact should alone make one who sews happy. You don’t need what you make be strutted down the runway to be proved it’s worthwhile…nowadays, half of what is seen on the runways is trash in my opinion anyway. Just make sure what you make for yourself is 100% you for you to show the beauty, individuality, and artistry to the powerful talent of sewing!